Homepage. This page: Old invoice from a company hiring out hearses, motor cars, taxis and wedding cars. 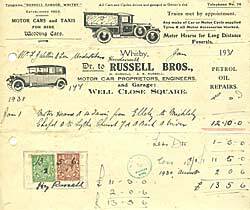 This headed invoice was issued in January 1931, by a motor car proprietor located at the Russell Garage, Whitby in Yorkshire. As well as hiring out a hearse for the more sombre occasion, they could also furnish the local populace with wedding cars & taxis, with a drawing of such a chauffeured motor car featuring on the left hand side. At the top of the invoice is the drawing of a specially-bodied motor hearse, of a type that goths and the like would probably quite like to own today. It has solid disc wheels, although what the chassis is I don't know. It could have started out either as a saloon car or a light commercial, and been bodied by a specialist coachbuilder. The hearse body on the back could well have started out life as a horse-drawn hearse, and been modified to fit on the back of a petrol-driven motor vehicle. The fittings must have been quite ornate, quite possibly with curved embossed glass side panels. It must have been quite a machine, as the text on the invoice advertises their 'Motor Hearse for Long Distance Funerals'. Elsewhere on the sheet we're told that trains could be 'met by appointment', and 'any make of car or motor cycle supplied' as well as 'Tyres and all Motor Accessories stocked', so the Russell Brother's Garage must have been quite a large establishment. Does anyone have a photograph of this old garage? This invoice was for using one of the company's hearses and four taxis, driving between a Chapel and Church, including the hire of a chauffeur driver. The overall cost was £13 5s 6d, issued to an undertaker nearby, who presumably passed the charges on to the deceased's family. 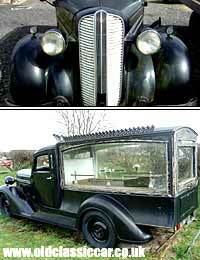 Shown here is an unusual Dodge hearse that came to light in 2006, dating to the late 1930s. It had been fitted with a horse-drawn hearse body from new in 1938 and still had it fitted to the rear chassis. I'm told it has been sold on for preservation. Perhaps surprisingly, there is a following for old hearses. The Classic Hearse Register is a good place to start, if you want to find out more about these unusual motorcars. If you live in Australia, you can even choose to make your final ride in one of several preserved hearses owned by this company.